I’ve been leveling up my new Musketeer Captain Victoria Hobbes. In doing so I’ve been looking for updates to the game, or parts of the game that I’ve missed when creating the original game guides for the Portal here. I discovered a new series of quests within Skull Island that begin in Gullet. 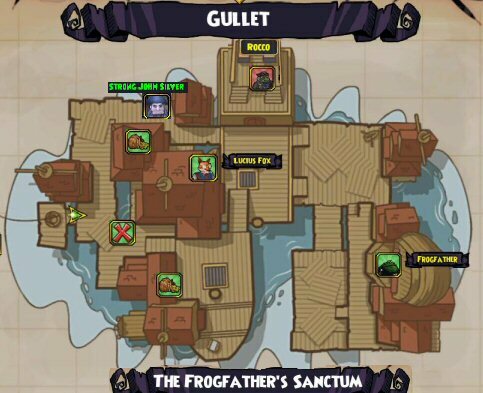 When you visit the FrogFather, check around the Gullet docks for additional quests. You may find Strong John Silver on the north side of the docks. He’ll be near a small house. He’ll have a seemingly meaningless quest for you dealing with gun powder. But when you return to him, quest complete, he’ll have some valuable information about the Rat Pack which will lead you back to the FrogFather. That quest will lead you to Skull Island and a visit to the Tavern which will send you to the cave behind the water fall. It’s worth going back and checking in on Gullet and discovering if you have some new quests to work through.